Unfortunately the best evidence is now hidden beneath 80+ meters of ocean. An accelerated phase of sea level rise occurred between 14,600 to 13,500 years before present, when sea level increased by some 16 to 24 m as the glaciers melted. I agree with the speculations, that prehistorical humans did a lot more traveling and further by boats and canoes. Rowed or poled. Than we have imagined. As S_F points out, most of the coastal routes are now concealed by rising oceans. Those early voyageurs up rivers and streams? Their camp sites, close to water were probably scoured away by thousands of floods. Or dug up or covered over by later human settlements. Another reason to consider the viability of travel along the shores would be availability of food sources and fuel to cook with. With the harsh climate conditions, the travelers would find maritime fish, shellfish and aquatic mammals a lot more reliable than inland game. In addition, the pinnipeds and cetaceans were food, hides, oil for cooking. Ivory, bone, shells were an entire industry of sustenance and useful tools. Nevermind that it's been genetically proven that the "Europeans" of today have absolutely no relation at all to the first people in Europe. Nevermind that "Europeans" of today only have 'white' skin now because they were conquered and replaced by light-skinned people of the Middle East around 9000 years ago. Nevermind the decades past where 'white' "supremacists" have been continuously asserting that they are the direct descendants of the first people in Europe and that those people were always 'white'. I thought the first people of the America's was supposed to be THE WHITE RACE and it's supposed to have all sorts of political implications? I keep hearing "experts" whisper "...by sea, by sea." Only problem is that none of the researchers/theoreticians/experts is ever described as having any open ocean sailing experience. NEVER! WTF? They also never mention having consulted modern long distance sailors for their advice/opinion. NEVER! Of COURSE people traveled the world by SAILboat (no rrwillsj, not rowed, not poled), but apparently that's apostasy. Ah well, what can you expect of "scientists"? Wake me when that understanding becomes part of their "science". Or, just call me!! What I can do was possible many tens (or hundreds) of thousands of years ago. Remind me again about those college entrance exams that select (or is that cull) smart people. salty, you have some good points there but that popeyed squint of yours has resulted in myopia. Before sails were invented? Where ahoy is the evidence that it was tens or hundreds of thousands of years ago? You are talking about transoceanic travel. The researchers for this project are talking about hugging the shore. In short, probably mostly daylight hops, all the way from Siberia. Along the North-West shore, then the Californias, Mexico, Central America and down to Chile. This entire route is popular today for experienced and professionally led kayakers. And as a major trade route all through the Meso American Era. Until the compass and astrolabe? Only a few sailing ships would dare to leave sight of land. I recommend reading "Longitude" by Dava Sobel. It will clarify the difficult realities of applying science to the craft of sailing. And make you wonder if hubris is a requirement for being an Admiral? The title sure didn't do Columbus any damn good! Only problem is that none of the researchers/theoreticians/experts is ever described as having any open ocean sailing experience. NEVER! WTF? They also never mention having consulted modern long distance sailors for their advice/opinion. NEVER! disregarding Heyerdahl and Jon Erlandson for the moment... you mean like this? If it doesn't put food on the table what is it worth? So, my question is, have Captain Stumpy or rrwillsj done long distance voyaging in a sail boat. Put differently, have either of you walked a full ten miles directly along any coast? I'm not saying small boats didn't come into play, rather that somewhat larger vessels and the long distances that they can take a group of people seldom get discussed. We must make a distinction between land people (land lubbers), who only go as passengers on one or two voyages looking for more land, from those who are married to the sea. As for the invention of sails, they can't find the first time they were used because they have been in use for tens of thousands of years and the climate near the ocean turns things into mush pretty quickly so the evidence is sparse, but there is some. 'Scientists' are researching generally means they "are looking into it", which carries the implication they are starting from scratch. Why not talk to people who know? The article above does not even mention boats. The word is simply not there. It is left to the reader to decide if the people walked, did coastal hops or came from a long distance. My irritation comes directly from the fact that such researchers propose a 'route' for people and then don't even bother to explain what they mean.Obviously they can't tell if this was a painfully slow travel by people moving house every ten years or quickly by small boat along the coast, but they don't even discuss any possibilities.Are we to believe they are agnostic or just ignorant? The 'simple' people of the ancient past were not simple. Certainly they were more sophisticated than land lubbers today. Who were the 'scientists' consulting to come up with their theories? Anybody at all? I made a small mistake. This article does have the word "seafaring". In an earlier article by Lesnek, there was no mention at all. Still, my observations and questions stand. By the way, there is firm evidence of people in the southwest of the U.S. 30,000 years ago. How did they get there? There are potentially even older dates for people in South America. Did they come across a land bridge from Antarctica? /s After all, the Piri Reis map shows an ice free continent, drawn before they had complete maps of North and South America. If it doesn't put food on the table what is it worth? So, my question is, have Captain Stumpy or rrwillsj done long distance voyaging in a sail boat. Put differently, have either of you walked a full ten miles directly along any coast? my observations and questions stand. "Only a few sailing ships would dare to leave sight of land." That "few" included Chinese, Indian and Arab traders, Polynesian, African and Carib travelers, and possibly South American rafters. Almost every scrap of habitable land on the planet was occupied, including places that were days/weeks from the closest land. Your "few sailing ships" refers only to the European sailing tradition, primitive ships from a backwards corner of the globe ruled by barbarians. Cusco, we need to separate what we know now from what earlier sailors, of many levels of competency, knew then. Columbus does deserve credit for pressing ahead to cross the uncharted Atlantic. Vainly attempting to discover the route to semi-mythical Cathay. Charts were damn few & notoriously unreliable. The simplicity of the navigation tools were made up with the experienced skill of the Sailing Master. Who had been to & returned alive from the destination your merchant house wanted to trade with. As supercargo, you sent expendable son-in-laws. If they failed to return? At least the cargo was profitable. If the boy wonder survived? If he was smart enough to shut up & listen to the Sailing Master & other veteran sailors? He might have chance at his own ship. Or at least dying of old age in bed, with weeping heirs all about. Not many sailors were so fortunate. The problem with the study comes from another side - it shrinks the migration pause to ~ 3 kyrs. The dating of remains south of the ice barrier, of people who may have vanished from the genetic record, is fuzzy. But it looks good against the available data! ""The rock surfaces are smooth and scratched from when the ice moved over it, and there are erratic boulders everywhere. 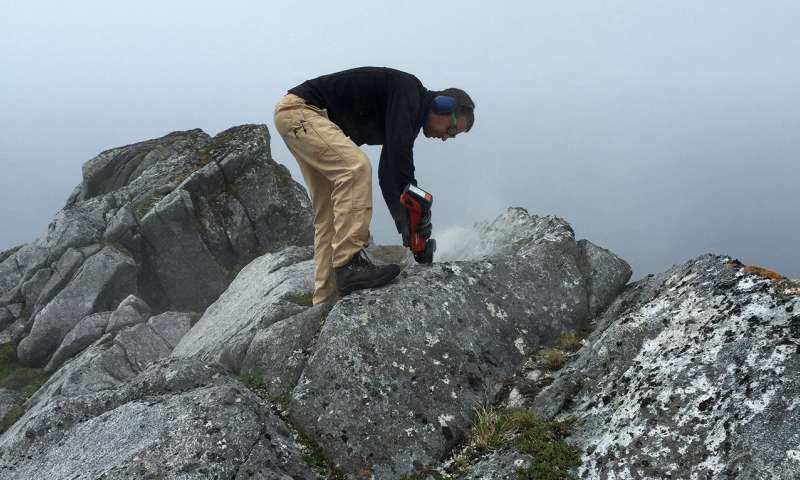 When you are a geologist, it hits you in the face." 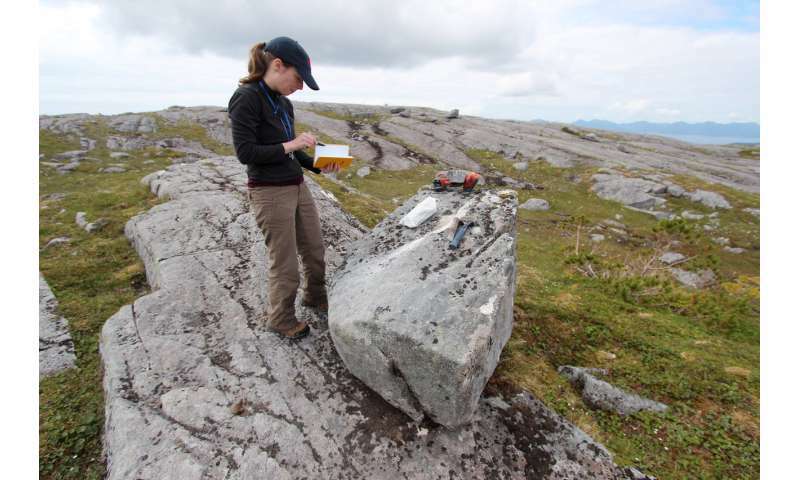 I am no geologist, but even I can tell from that first photo as I live in a postglacial area. Lots of mountain and coastline looks like that around here. By the way, there is firm evidence of people in the southwest of the U.S. 30,000 years ago. How did they get there? There are potentially even older dates for people in South America. Did they come across a land bridge from Antarctica? /s After all, the Piri Reis map shows an ice free continent, drawn before they had complete maps of North and South America. By the way, there is not any firm evidence of that nature, and the one find that is possibly 30kyrs is contentious. But if any such finds would hold up, see my previous comment, the ice barrier era is now short. 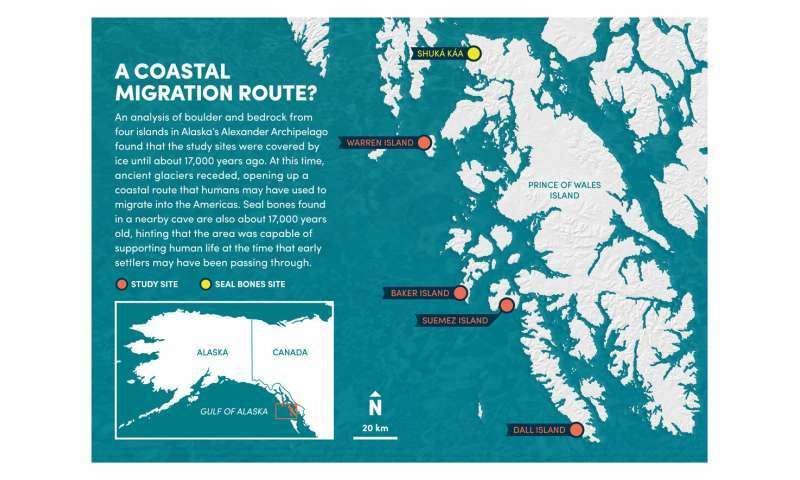 The coastal migration pathway has been the mainstay of paleontology for decades by the way, read about it. It is lately that there has been finds that show some shortcuts in Levant and Asia (and possibly America, c.f. the still viable corridor and plausible genetic flow patterns further south). [ctd] The Piri Reis map is not the most accurate from those times, and the North American coastline especially unrealistic. "There is some suggestion that this area may represent the Asian coast." "More recently, the map has been the focus of pseudohistoric claims for the pre-modern exploration of the Antarctic coast."